Please forgive me for getting a day behind. I just ran out of go-juice yesterday……I know you understand. 🙂 This morning the boys had a tough time finding Elfie. 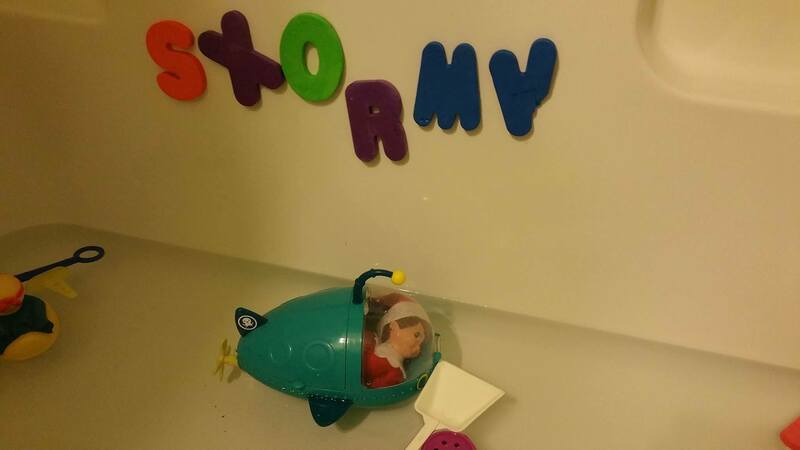 They eventually, with a few hints, found him snoozing in the Octonauts boat in the bathtub! What could he have been doing in there!!!! Our craft for the day was to make a sail boat ornament to go along with our story…..however, “Elfie” seems to have misplaced one of the pieces so our only materials were a mast and 2 sails. That naughty “Elfie”. Okay, okay, I have absolutely no idea what happened to the main boat piece. It will turn up somewhere…… maybe. 26 He replied, “Your faith is so small! Why are you so afraid?” Then Jesus got up and ordered the winds and the waves to stop. It became completely calm. Once we read this Johnathan started jumping up and down saying, “That’s what Elfie was doing sleeping in the boat!” I asked the boys if they would be afraid like the disciples were? Naturally since they are of course super heroes, their answers were “No, we wouldn’t be afraid at all. Jesus is with us.” WHAT? Hahaha, these boys……..from the mouths of babes right! I confessed to them that I sure would be afraid but that they were correct. Next I asked them if this was the same type of thing we talk about when they are scared at night about having a bad dream. They are afraid then right? How could they be fearless in a boat at sea and yet afraid laying in their own beds at night? The mind of a kid, that’s how. This hit closer to their reality. In the same way that the disciples should have had faith that Jesus would take care of them, Jesus is right here with us each day and night and we can have that same faith to trust Him to take care of us. I think this is an important story and truth to remember for us adults in our daily routines and in the hard times. Trust God enough to give Him your stuff. He is big enough. He loves you enough. He has your best interest at heart. And He will never, ever fail!